Google Apps offer Reliable, secure online applications. Give your employees power to collaborate & communicate using enterprise class applications without hassles of managing them. Google Apps is the Best Personal Productivity tools you can give to your employees. Google Apps gives you savings, security and innovation. You will get 25GB inboxes, video chat, anti-virus/spam protection, disaster recovery, and a 99.9% uptime SLA for just $50 per user per year with Google Apps Premier Edition. 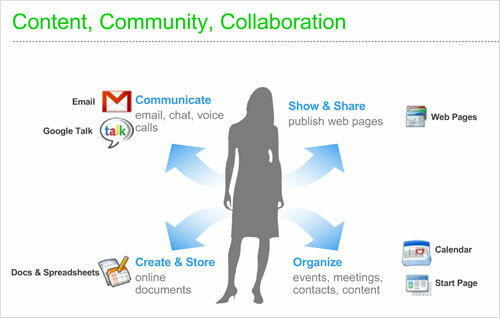 Unified communications: Get email, calendar, IM, voice and video chat. All the real-time collaboration tools are included free with Google Apps. Easy, efficient and useful Email: Easy to use and deploy email solutions with less spam, 25GB space and built-in Google search are some of the features that employees enjoy. Access email from anywhere and choose the interface your employees want: Gmail, Outlook®, or BlackBerry®. 25 GB for email is 50 times more storage than the industry average. Low Training investment: Your employees get tools with the familiar, easy-to-use Gmail user interface, helping you cut training costs and ongoing support. Manage your business, not your mail server: Google Apps gives your company solutions that are globally scalable with world-class security. You will always stay current (updated to latest version) in the cloud and there will be no more maintenance, upgrades, or patches. Your IT department can focus on innovation and cost reduction rather than on maintenance, upgrades, and network protection. Google with its world class secure data centers give 99.9% uptime reliability guarantee with synchronous replication. Mounting costs pressures, outdated end user applications, and IT productivity concerns are some of the reasons that IT decision makers switch from other enterprise mail systems to Google Apps for their businesses. Google Apps delivers lower costs, user satisfaction, and cloud infrastructure benefits. According to a leading research firm - Google Apps is as little as 1/3 the total cost of competing solutions. Business Case and Cost Benefit Analysis of Google Apps will give top management executives - Business Leaders, CEO, CIO, CFO - an insight in how Google Apps & Cloud Computing will transform their business and meet objectives. Our seniormost and expert consultant at HIM Technologies work with your Business Leader, CEO, CIO, or CFO closely to understand your needs and prepare a Business Case and Cost Benefit Analysis for implementing Google Apps. The potential of Cloud Computing in the success of an organization can not be ignored. But there are always more questions than answers about the cloud which is delivering the IT services via web based on a on-demand pricing model. You may ask so what if I reduce my cost but I may lose control and what about security. Our viability study will not only cover the cost and benefit aspects but will also evaluate the risk factors, critical to success factors to deliver you a comrehensive picture - thue helping you in taking a wise decision. Pricing details: Ask for pricing which depends on nature of assignment and size of organization. Click here to contact us. Imagine if Brands can deliver tailor made. We appreciate your uniqueness by delivering bespoke solutions on proven platforms. Our bespoke software development solutions are exceptional exquisite and surprisingly flexible to accommodate your exclusive business requirements.